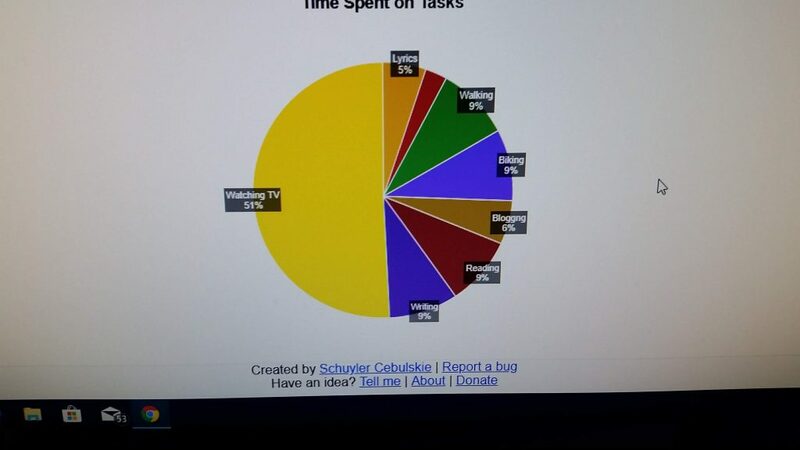 My Pie Graph and Television - Look what I made! I was looking at my retirement life and I think that when I was working, I really enjoyed coming home to a relaxing reclining chair and the television remote control. Yes, that was just what I wanted, and maybe a glass of wine. I also wanted cheese. I love cheese. Wine and cheese…and a remote control. What could be better…or worse? It was ok when I was working to participate in this activity. I should say, when I was employed. Now that I am not employed, I get to spend much more time at the reclining chair and the remote control and all my meals are taken in a comfy chair. Well, I wanted to see what this was doing to my life. The yellow is my TV watching time…not a goal but clearly my distraction. In my Google Drive, I found an app called the task timer. I spent some time mapping out activities that are important to me, or so I thought. Some of the more difficult things for this introvert are making phone calls. This activity always gets put off. I tried to create workable 30 minute blocks of activity so that I can get some daily activity on all of my important tasks. At the end, I tried to get real with my life, so I included watching TV as an activity. The first day had a hideous amount of time with the television. The reason for this is that I take my lunch in my recliner with my remote. Then comes sleep. My takeaways are this from the data that I have seen. If I eat in front of the TV, I am going to go to sleep. I am also going to fill my head with crap from other people’s priorities. So, over the past few days, I have tried to eat in the kitchen or the dining room. This means eating away from my family. I hope that this translates into more productivity. That should be the goal. It’s only January 2. I should take advantage of this early revelation and develop a new habit.